iEARN-Gambia educator, Poncelet Ileleji, is participating in his local YMCA after school program with students ages seven an up. The students will be creating electronic magazines about their school, the environment and emerging technologies from their perspectives, hopes and aspirations. The project started at the end of June and Poncelet is looking for other schools or classrooms interested in collaborating with his students via the Electronic School magazine project forum. Electronic School Magazine, facilitated by Mutasem Mafarjeh in Palestine, is an international collaborative project for students of all ages to create school magazines around issues of their interest and share their publications globally. 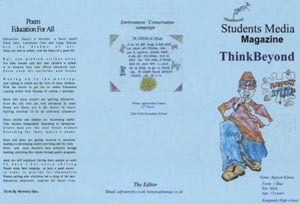 School magazines are a great tool for encouraging various academic and creative skills within students. This is great way for your students (ages eight and up) to use their creative writing skills and experience being part of an intergenerational global community. Some exciting plans for the project this coming year include an annual magical moments day festival at schools and public places around the world. Visit the project website to read a samples submissions. 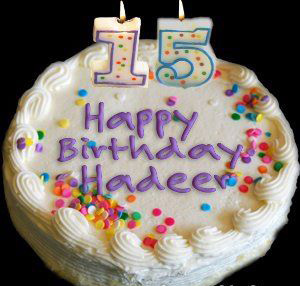 Nazima Jabeen, at Beaconhouse School in Karachi Pakistan has designed a new project that allows your students to study historical events on a day they are sure not to forget – their birthday! The project, for ages five to sixteen will be on-going throughout the year. Nazima is looking to get started on the project with partners from around the world. In the Teacher's forum along with her project announcement, Nazima provides some tips for ways in which educators can approach the research they do with their students and also encourages participants to use social media to enhance their collaboration. This a a great oportunity for your students to research events on their own, and learn first-hand from their peers about important events in their own country and around the world on their special day. Recently posted in the iEARN Teacher’s forum is a message from iEARN-Japan country coordinator, Yoko Takagi asking educators to encourage their students to post in the iEARN Youth Forum and communicate with a high school student, Seiya, from a special needs school. The school does not offer a program to send students to university, so they are doing practical job training and writing about their experiences. Please have your students log on and communicate with Seiya. He will greatly appreciate hearing from his peers around the world who can share their own experiences and encourage him with his English. We are now accepting submissions for the 2012-2013 iEARN Project Book, to be published in September! To renew or submit a new project please login to the iEARN Teacher's forum. 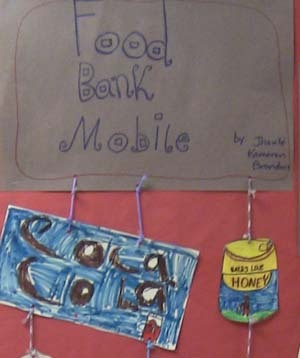 Click on the discussion topic,"Time to prepare the 2012-2013 Project Description Book!" If your project is already active, please simply submit an updated template. If it is a new project, please note that all new projects must indicate that they have an initial group of participants before being considered for publication. 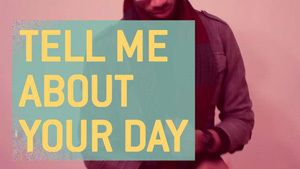 Along with the description, we would like to include an image to accompany each project. If you have one that you'd like included, simply include it as an attachment. We ask that the template below be completed in full, with us much detail as possible in the description, and about the project timetable and activities. PLEASE NOTE: We require that anyone submitting a project proposal in iEARN must first recruit a group of classes (either in your region or globally) to participate before the project is launched, to ensure that there will be activity in the project forum once it is announced. In addition, we ask all project facilitators to proactively engage youth in the design and facilitation of projects. You can find more information about project facilitation in iEARN at the bottom of this page and you can also email the iEARN Project Assistance Committee anytime for help with your project ideas. The final deadline for updates on projects was May 31st. The deadline for new projects is August 1st., After this deadline of August 1st, projects can be included online, but will not appear in the printed Project Book. In addition, we will archive the projects of any project facilitators who have not renewed their project template by this date so that only active projects appear on http://media.iearn.org/projects. Congratulations to Firuz Baratov and Zebonisio Murodova the new coordinators of iEARN-Tajikistan. 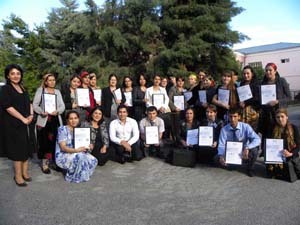 iEARN-Tajikistan currently has over 40 active member teachers. This year the organization joined the Global Connections Exchange program. We look forward to seeing you grow iEARN-Tajikistan, and hearing about the projects and activities you are doing. Finding Solutions has been one of the most popular projects this year. Well done Deanne! We look forward to following the series. A collaboration that began at iEARN’s 2011 conference in Taiwan now has a e-book! Students at Deguang Catholic High School and their educator, Petty Wu, recently finished their project research for the Local History project. Below is a link to the survey. Individuals must be at least 13 years old to participate. Thanks you for taking the time to provide some valuable feedback. • June 25, 2012 - Registration page on the current Collaboration Centre (media.iearn.org) was de-activated. You can still access the Collaboration Centre, but no new registrations can be made on the site. • July 27, 2012 - Current Collaboration Centre will become "read-only," meaning content will be accessible, but no new posts can be made. iEARN's associated forum mailing lists will be de-activated. • August 5-10, 2012 - Launch of new Collaboration Centre (collaborate.iearn.org). Users will be able to log in to the new Collaboration Centre with their existing iEARN login and password, and will be able to continue accessing the current Collaboration Centre as a "read-only" site. This year's annual conference will be our first virtual conference. The conference will be held November 12-16, 2012. This is an opportunity for us to bring together more iEARN educators than ever before, with the added touch that iEARN has of creating a friendly and personable experience for virtual collaboration. Sessions will be held in multiple timezones and in multiple languages. Call for presentations is open now! 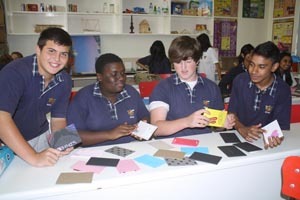 To learn more about the conference visit the information page on the iEARN International website. iEARN's 2013 Annual Teacher and Student Conference will be a face-to-face meeting in Qatar. The iEARN coordinators of Morocco, Tunisia, Egypt, Lebanon, Jordan, Palestine, Iraq, UAE, Yemen and Qatar will be coming together in Doha, Qatar hosted by iEARN-Qatar to establish the iEARN-Arabia entity and clearly define its vision, mission, goals, status and format. The meeting objectives are to develop a strategy and operational plan and ensure commitments of the attending members. Among iEARN-Arabia’s goals are to share and develop educational resources in Arabic language, as well as support the running and spread of the iEARN activities in the member countries. http://www.iearn.org/event/iearn-arabia-meeting-doha-qatar. A great initiative! We look forward to photos and information on the meetings outcomes. Eradication of Malaria project students from Gaborone Secondary School in Botswana and their partners from Alexander Dawson School in Lafayette, Colorado received a lengthy feature on national television in Botswana. The report praised the students’ campaign going door-to-door to raise awareness about malaria prevention. Nine students from Alexander Dawson travelled to Botswana to meet their peers and work together in person on the campaign. Very impressive! 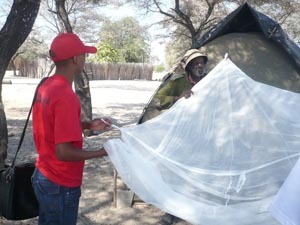 The Eradication of Malaria is an on-going project open to everyone throughout the year, however, every summer students from Lafayette and their educator, Bill Meyers, travel to Botswana.